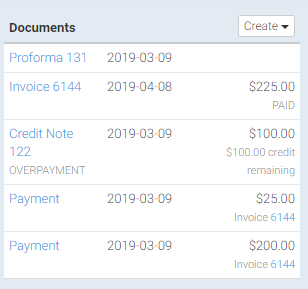 Invoices remain in an open state until the balance is cleared either by recording payments or applying open credit notes to the invoice balance. This page describes creating and managing payments (where a customer has actually paid you money). Navigate to your Sales Order. Select "Payment" from the Create, drop down menu on the top, right of your screen as shown in Figure 1. Or, select Payment from the Payment drop down menu on your Invoice as shown in Figure 3. Once the "Add Payment" dialogue box is opened (Figure 2), ensure the correct Invoice is listed. 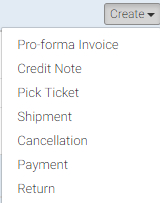 If not, select the drop down arrow to change to the correct invoice. 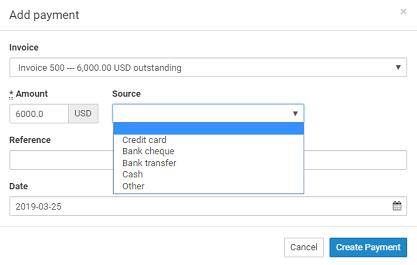 Type the amount of the payment as shown in Figure 2 in the Amount field. Select the Source of the payment (credit card, Bank Check, Bank Transfer, Cash or Other). 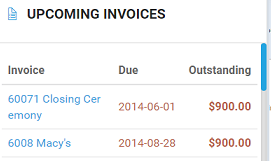 When creating a payment, if a value greater than the outstanding balance is entered, then the invoice will be marked as fully paid as shown in Figure 5 and an "over-payment" will be created as shown in Figure 6. After creation, over-payments act identically to credit notes. They represent a credit to the customer's account and their value can be applied to future invoices. After creating an over-payment, if you wish to undo the whole operation, you'll need to delete both the invoice payment and the over-payment from the sale. You can also see what is "outstanding" at a higher level (for all sales orders) by selecting Invoices from your left main menu or looking at your dashboard.